The Big Wobble: A mag 5.8 - 173km struck W of Ferndale, California after a week of near misses along the Ring Of Fire: When not if will we run out of luck? A mag 5.8 - 173km struck W of Ferndale, California after a week of near misses along the Ring Of Fire: When not if will we run out of luck? 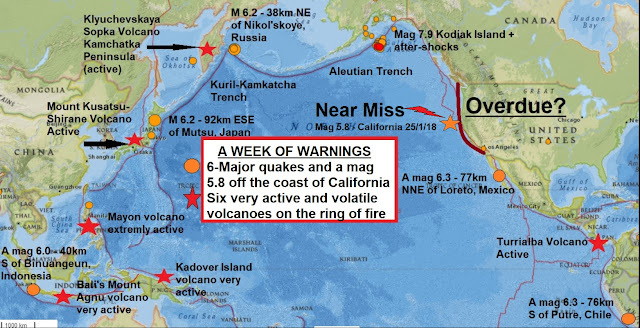 What a week a week it's been for The Pacific Ring Of Fire and millions of people can consider themselves very lucky because it was also a week of very very near misses. Yesterday evening I wrote; "the whole Pacific Ring is rumbling, from Alaska to Papua New Guinea and Chile to Russia and Philippines to Mexico with one exception, once again the US West coast has come away unscathed but for how long?" See Here. I woke this morning to the news the US West Coast rode their luck once again when a mag 5.8 - 173km struck W of Ferndale, California with a mag 5.0 after-shock, it could have been much worse. As The Philippines is bracing for a possible three-month-long emergency in areas around an erupting Mayon volcano, which has already displaced more than 81,000 and caused overcrowding at temporary shelters, and the U.S. claiming the West Coast region is most vulnerable to tsunamis - the massive waves of water unleashed by undersea earthquakes - is dangerously under-prepared, we must surely be asking ourselves when not if will the big one strike! More material for incorporation into the 'why' of the 'when' we will run out of luck.